Texting and driving is dangerous – that is a fact. Americans are highly aware of and concerned about the issue. More than nine in ten Americans believe sending (94%) and reading (91%) texts while driving is dangerous. 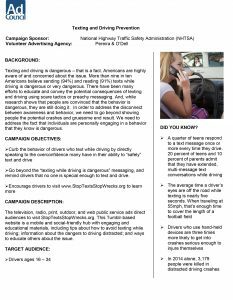 There have been many efforts to educate and convey the potential consequences of texting and driving using scare tactics or preachy messaging. And, while research shows that people are convinced that the behavior is dangerous, they are still doing it. In order to address the disconnect between awareness and behavior, we need to go beyond showing people the potential crashes and gruesome end result. We need to address the fact that individuals are personally engaging in a behavior that they know is dangerous. This campaign targets drivers ages 16 – 34 and seeks to hit home the idea that even though people feel impervious to the dangers of texting and driving, they are not. Nobody is special enough to text and drive. This one-page fact sheet includes background information on the Stop the Texts. Stop the Wrecks. Texting and Driving Prevention campaign.